I bought my Porter Cable C3151 off Ebay. It is a reconditioned unit, so the price was great - only $209 with free shipping. The C3151 is heavy and hard to carry while it is in a box. It isn't so bad now that it is out of the box and I can use the handle. It needs legs so it can stand up tall. I'm guessing they didn't put them on so owners won't run it in the vertical position. It would be nice to be able to stand it up when moving. Right now it is like a carry on suitcase that can't stand up. The handle that pulls out is nice for wheeling it around. It seems pretty loud. Much of the sound comes from parts that rattle. I'll try to put some rubber pieces in a few places and see if that helps. I think much of the rattling comes from the mobility kit. It is fast. After the 15 minute break in without building pressure, it went from empty to 150psi in about 1.5 minutes. It doesn't leak. I've used compressors that leaked so bad they would turn on every hour even if I didn't use it. This one has been at 150psi for almost 3 days. Yesterday I had a chance to use this compressor. The wheels were great for getting it up a steep, rocky hill. When I turned it on it was up to pressure quickly. I only hung one door, but everything worked as expedted. In the next month it will get a lot more use. I'll be using it to hang doors and do finish work. Once that is done I'll be putting down about 1,000 sq. ft. of bamboo floor. 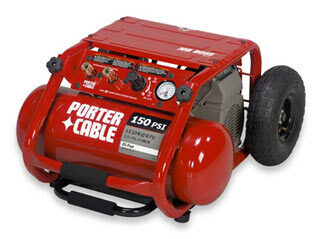 I've been doing finish work using this Porter Cable compressor. I don't have anything bad to say about it. It easily keeps up with a finish nailer, but that isn't a surprise. The regulator and pressure switch work fine, it kicks on at about around 120 psi and doesn't take long to get back up to 150psi. I should update this. I've had the chance to use the compressor with a Dewalt Framing nailer and to dump some air in a few tires that were low. It always keeps up well. The only thing that really worked it was when I was blowing off the floor with a nozzle, but that was expected since it is a very high demand task. Page generated in: 0.0015 sec.